It is clear that we are in good company. Even the great saints had their struggles. It is also clear – and again a great comfort – that God does not make perfection one of the criteria for calling us to our respective vocation. Rather, it is through faithfully living out our vocations day after day that God does perfect us. Certainly Jesus did not call Matthew to be an Apostle because he was already a perfect human being and highly qualified for the job. We know full well that tax collectors were looked down upon, usually lumped together in the Scriptures with prostitutes and other sinners. They were collaborators with a foreign power and they often milked people for all they could get. Matthew was probably anything but perfect. The brief encounter with Jesus recorded in this week’s Gospel brought about a profound change. It was no small thing for Matthew to abandon his post and become a disciple and, ultimately, one of the Twelve. He had to give up a lucrative livelihood to follow an iterant preacher who had nowhere to lay his head. It also meant making a break with a certain way of life. There could be no more defrauding a neighbor or any other sinful practices associated with his trade. He had to take up his cross and die to sin. That Matthew so quickly abandons his post makes us wonder if deep down inside he was longing for a peace and happiness of soul that he could not find with his ill-gotten money. Perhaps he was sick of being lumped in with wretched sinners all the time and wanted to be free. Christ gives him that freedom. Matthew is quick to share his joy with his friends and would later go on to pen a Gospel. It should give us comfort to know that Our Lord did not just see a sinful man. He saw one of those chosen by His Father to be one of the pillars of the Church. Our Lord did not just see what Matthew was. He saw what Matthew could be. If He could do so with one of the Twelve, could He not also do so with us? We have long memories. Thoughts of past indiscretions and sins fill us with dismay and regret. We begin to doubt our worthiness to be parents, teachers and preachers of the Word. But like I said before, God does not make perfection one of the criteria for calling us to our vocations. If that were the case, God would not have very many people to draw on to be husbands and wives or priests. He calls us to these tasks even though He knows full well we are not perfect, knowing full well we can be made perfect through them. Vocations are paths to holiness. 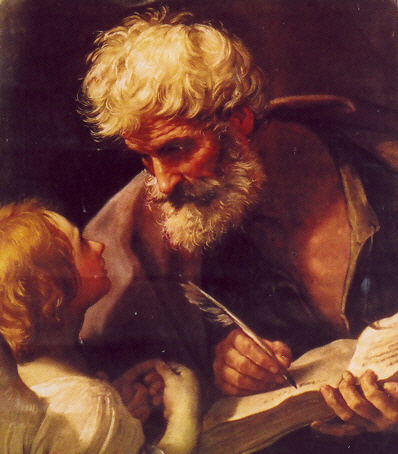 Like Matthew, like St. Paul, and like St. Gregory the Great, we can do no more than acknowledge that by the grace of God, we are what we are, and give thanks that He has called us to share in such noble tasks.